A further thought came to me this morning regarding the Border Mail’s Brad Worrall and his distaste for blogging. The Border Mail is now owned by Fairfax who have tried, while mostly failing, to harness some of the cachet of the blogosphere in their own online offerings, so I thought I’d do a search of the Border Mail’s website to see if they too were part of the Fairfax blogging revolution. 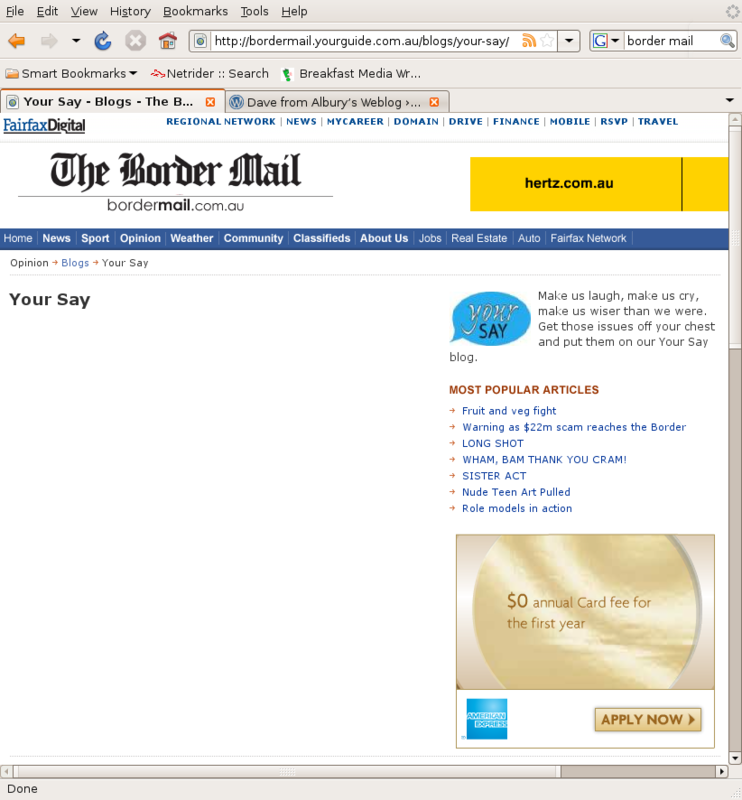 I was astonished to find that the Border Mail does indeed host a blog section on their website, so I commend to you the Border Mail’s “Your Say” Blog. Another example of the quality we have come to expect from the Border Mail. so what? I’m looking at a blank screen here. Is that what I’m supposed to be seeing? It’s weird. They seem to have their set-up wrong. The “your say” page is blank, which is not surprising considering there doesn’t seem to be any way of having “your say” on that page (no comments section to click on). But if you go back ro the “blogs” page and click on “National comment” you get something resembling a blog written by someone appropriately named “Gittens”. You can make comments on the few selected topics writen by “the Gitt”, if you could be bothered. The writing style is hardly what you’d expect from a blog though and frankly it’s a real yawn and a turn-off. They should just give up on that. Btw, rather than respond formally to Brad Worral’s piece last week, I think it’s best we just wait and see if HE says anything about it in his column tomorrow. I think he’d be aware of the responses we’ve all made (ie yours, AWOL’s & mine) on our own blogs, so it will be interesting to see if he mentions them. If he doesn’t then it might be time to issue that formal response. Yep, that blank screen is their ‘Your Say’ Blog. As Ray has pointed out their ‘National Issues Blog’ is just reprints of Fairfax articles with a comments section. they did once have a “reader’s comments” section where you could comment on various articles. Would it surprise you that the comments were overwhelmingly of the ignorant red-neck variety? I reckon we could scare the bejeezus out of Brad by offering him a Guest Contributor role on all four border blogs. R U Game? Yeah, Greg, good idea. Could even make some sort of an official badge. Make him feel all important, sort of. Greg, I’m more than happy to debate him and offer him right of reply in the comments thread, it’s a courtesy I extend to anyone who has an opinion they’d like to share about anything I write. I’m not really interested in having him write as a guest contributor though. If he wants to start a blog he should go to the wordpress homepage and hit the button marked “create a new blog”. I’m sure there’s a readership for that kind of “writing”. I’m with AWOL on this one Greg. Besides which, it wouldn’t surprise me if the ‘bloggers’ that Brad is referring to are simply figments of his imagination as his two pieces bear no relation to any of the four blogs that we identify as locals. He doesn’t deserve such an invitation Greg, but as AWOL says, he’s more than welcome to comment, anonymously if he likes! For all I know he already does – I’ve had a few strange commenters, maybe he’s the real “BrowserBob”? Sometimes the spam gets through the filter.